I'm doing well and am happy to report that today will wrap up PALS, our formal reading testing! Things at school will settle down a bit, for a week, before picking back up again! 5 weeks to go! I received a bit of a nasty comment on my post yesterday, suggesting I take a break from blogging. I erased it and debated whether or not to address it on the blog. My pride has gotten the best of me, so I'm going to respond, in a quick way and move on. Anonymous, if you are reading--this is MY blog and I will decide when and if I want to take a break from it. I've had quite a bit going on in my personal life lately (none of which I have felt the need to share on the blog) and I'm sorry if my lack of original, creative posts two weeks in a row upset you. I will never put this blog before my actual life, so if you want to read my blog, you will have to understand that sometimes life gets in the way of blogging. I've had a lot of creativity going through my mind, but for multiple reasons, I just haven't had the time to sit down and share them. If you don't find my blog interesting anymore, don't read it! And if you don't have anything nice to say, don't say it! So there...that's that! Moving on to today's post...one I'm very excited about! One of the things that has been taking up a lot of space in my mind lately is the fact that my parents are moving next month. Moving from the house they have lived in for 26 years and the place I have always called home. It's quite emotional for me, however, I am also really excited for my parents. They close on my last day of school, so my mom is excited that I will have the summer to help her get settled and decorate. 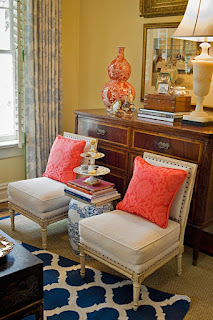 If you haven't figured it out yet, decorating is one of my very favorite things to do. My Home Inspiration Board on Pinterest is my largest board and I adore looking at pictures of lovely interiors and daydreaming about design. 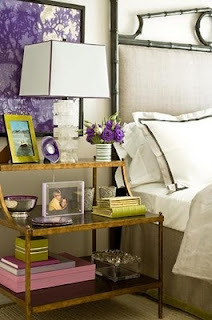 Sometimes at night, I won't even be able to sleep because I'm imagining how I would decorate or redesign a room. My mom is really excited to have a place all her own (our previous home had been in the family for quite some time and I don't think she ever really made it her own). That being said, I've given her an "assignment"-- Figure out your design style! I've told her to spend some time on Pinterest, perusing pictures of interiors. Once she's pinned many photos she likes, I told her to start looking for commonality amongst the pictures. What trends do you see? What is your style? My guess is that her style will fall somewhere around French Country...but we'll see what happens! 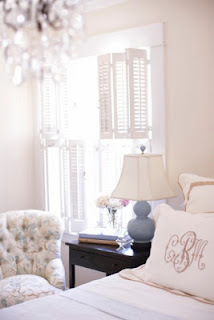 I'll give you a few examples now, by sharing some of my favorite pins as of late (all can be found and sourced via my Home Inspiration Board)! This is my idea of eye candy! 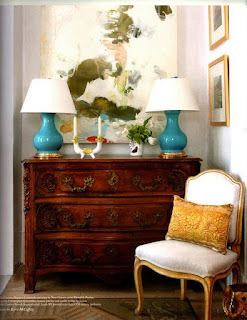 A very traditional chair and dresser are paired with abstract art and modern lamps. It is feminine, elegant, and beautiful while still looking relaxed! I've posted this photo before-- I am smitten! I love the idea of making a small space like this bar bright and bold! 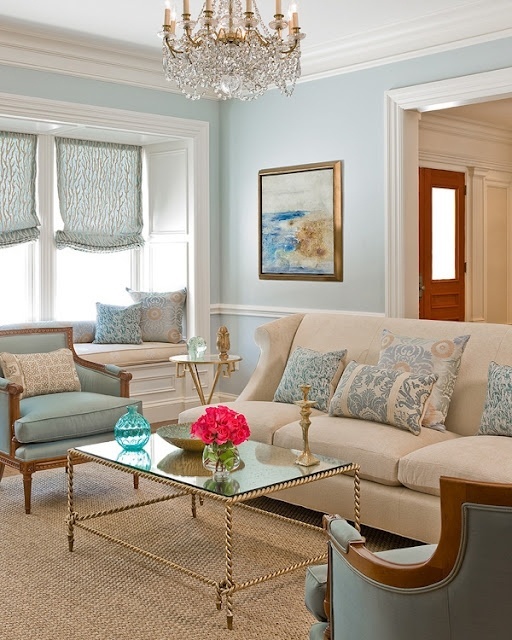 In this room, traditional pieces are used in a modern way! 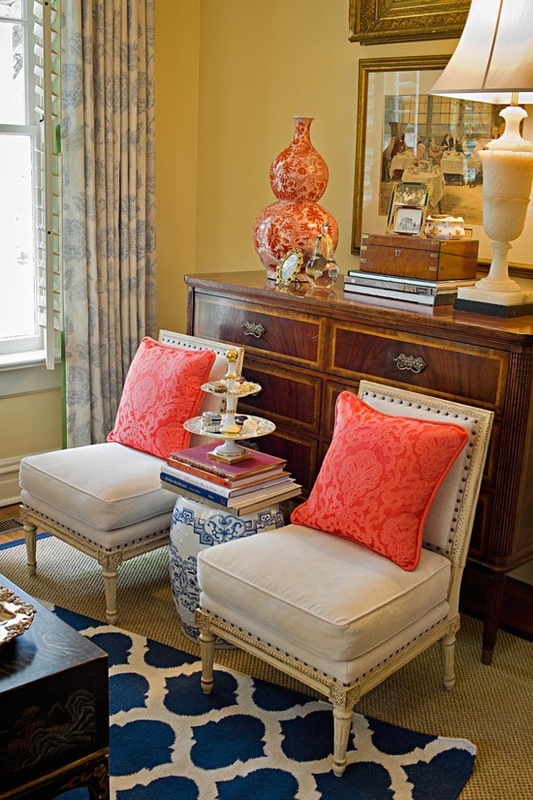 For example, the urn is a classic piece, but its orange color makes it pop on the brown wood! I also love the mix of prints! 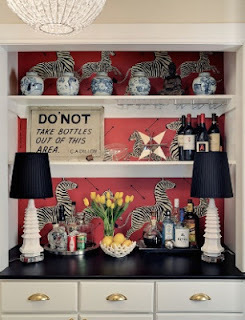 This picture is already a bit of an inspiration for Bryce's and my bedroom down the road. 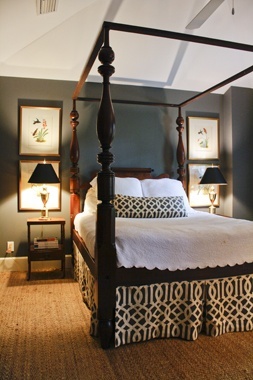 He has a beautiful four poster bed that was a gift from his mother, and I have a very similar white cover and shams. 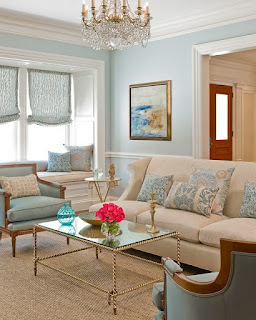 I love that this room has a fun touch with the throw pillow and bedskirt, but is still masculine and dark. This room is just about perfect if you ask me. 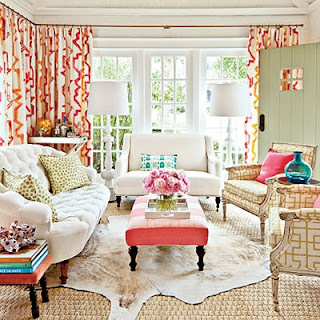 It has a very traditional feel for a formal living room, but is still fun with printed pillows, a gold mirrored coffee table, and hot pink flowers! 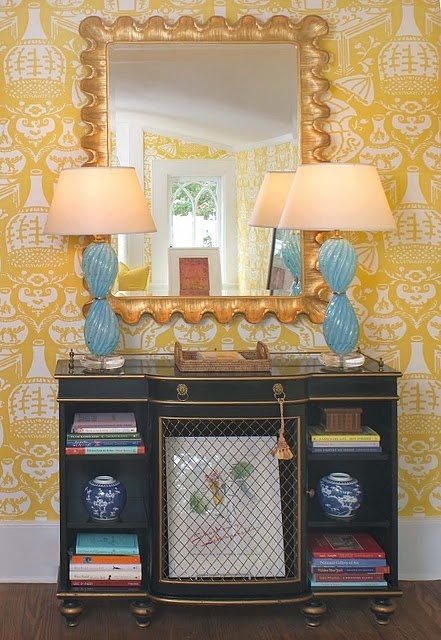 I can't pick a favorite thing about this foyer...it all just works SO perfectly together! I love that the black console grounds the otherwise bright space and that the ginger jars are juxtaposed with the aqua lamps! Did I mention gold accents as a part of my design style?..because they are! I want an exact replica of this nightstand bad! 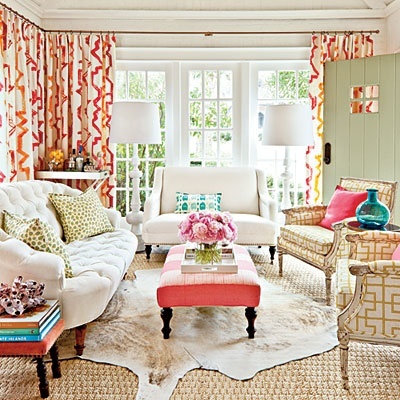 I don't know if I'd ever have the guts to design a room this bold, bright, and funky...BUT, isn't it simply fab?!? Don't forget to comment with questions and reader requests on my "Ask Allie, Part Deux" post from yesterday! oooh la la what a fun project for the summer for your and your mom/parents!! Moving into a new place is so fun. When my parents did it I SO looked forward to organzing, redecorating, and finding new, fun stuff to fill our home with!! I can't wait to hear/see details! SO sorry there was a rude comment. Luckily they're not very often. I love reading your blog, and I know others do as well! As a blogger I understand that blogging isn't your life (nor is it mine) and real things get in the way sometimes! We can't be creative all the time ;-) Keep on chugging girl!! Don't let the haters bring you down! This is your blog and you can post whatever you want to it. If they don't like it, they can leave. I love reading your blog!! I bet it would be SO hard to leave the place you've called home for so long. But the design opportunities are endless. You have wonderful taste and I'm sure it'll be perfect! LOVE that white bedroom with monogrammed pillow and you are right - that blue living room is perfect. I'm sure it's hard to leave your childhood home but what a fun opportunity for your mom. First let me say just ignore the rude comment.. I would be just devastated if you weren't blogging anymore! I absolutely ADORE seriously every picture in this post. That will be so much fun helping your mom this summer! I don't see anywhere on the design style choices "nautical, beachy, uses the theme of shells a lot" buttt if I did, that would be me, haha. and those anonymous comments are so uncalled for! It is YOUR blog, you can do whatever you want to with it :-) and there is a way to set your comments so that no anonymous comments are allowed.